My oven is giving me grief. I set it 75º lower than the temperature I want and it’s 25º higher than I want! How on earth am I supposed to have any success making macarons with an oven that’s even more finicky than the macarons I’m trying to bake?? Oven aside, I decided to give macarons another try this weekend. This time, I’m making Pistachio Macarons with Pistachio Cream Filling, another recipe I found through Pinterest. For the first time since starting on this adventure, I’m not using the basic recipe I’ve been using so far. This time, I’m following the recipe for the Pistachio Macarons exactly as written. As of right now, as I’m writing, they’ve been in the oven for a few minutes (5 or so) and already have feet! I mentioned in my last post that I was going to follow the advice of numerous bloggers and place another baking sheet on the lower rack of my oven because, in addition to not being able to control the heat, this oven also bakes unevenly. You can see that they’ve dried somewhat and are ready for baking. Feet… we have feet! (I tried to adjust the colour… unsuccessfully. In reality, they’re a lovely pale shade of green. All that’s left to do now is to make the Pistachio Cream filling. Silly me, I thought about taking butter out of the freezer last night but totally forgot by the time bedtime came around. I now have to wait for the butter to soften enough that I can cut off what I need. They may not be filled until later today (I don’t think that’s an issue). Early this afternoon, we’ll be going to my daughter’s to help supervise my grandson’s eighth birthday party. The filling likely won’t be made until after we’re back… possibly even tomorrow. … and a couple of hours later, the Pistachio Macarons are cooling their heels in the fridge. I decided to roll them in crushed pistachios for that little extra pop of pistachio flavour (colour’s still off). I did make the filling; I found a way of hurrying the butter along. That is a seriously delicious filling! It isn’t overly sweet, which makes me happy. I’m really not excited about tooth achingly sweet things. From what I’ve seen so far (haven’t tasted a completed macaron yet), they look amazing but I think I have a bit of hollowness again. As John said, though, considering the oven I’m working with, they are what they are. With a better oven, I know I’d have better results. Incidentally, placing the extra baking sheet on the bottom rack of the oven did seem to make a difference. The feet throughout the entire batch are pretty much the same, a first. Will I make these again? Oh yeah! Having tasted each of the components, I can’t wait to try the whole. Yesterday was gluten free day but I did also start a batch of croissants. I’ve made them before and they were a resounding success and, honestly, I don’t know why I don’t make them more often. They do take time but it isn’t a solid block of time. The first step is making the dough and refrigerating it overnight (or several hours). Easy – the mixer does all the work; I just throw in the ingredients. The second step is rolling the dough with enveloped inside it – three times. The dough needs to rest between rolling sessions and, after the third time, the dough is, once again, refrigerated overnight. The third step is the final rolling and shaping of the croissants, then baking. Even though I’ve found a recipe for gluten free croissants, I’m not sure I want to go there yet. And, besides that, I think John’s feeling a little bit of gluten free overload. Also in the plans for today is a batch of Speculaas, a beautifully spiced cookie from Holland. You may have seen windmill cookies in your favourite grocery store; well, those are speculaas and when you bake them yourself, your house smells amazing and your taste buds sing. They’re nothing like the store bought cookies. I won’t be rolling them out and using cookie cutters; I’ve had my eye on a cookie stamp and yesterday, I bought one. I’ll be rolling the dough into balls and using my lovely cookie stamp. The recipe I’m using comes from a Dutch cookbook, given to my mother by one of my cousins. Mom’s on her own and doesn’t do much in the way of baking anymore and she knows I can read Dutch so I became the proud owner of this cookbook. I’ve made a few things out of it already and they’ve all turned out great. I have had to resort to Google Translate once or twice but I’ve managed pretty well. There’s just one measurement in the recipe that has me bemused. In Dutch, the recipe calls for “2 mespunten” of a couple of spices. Translated, that’s two “knife points”; how much is a knife point? The recipe also calls for Almond Essence; it’s not something most of us are familiar with but Dr. Oetker makes essences in tiny tubes. They’re much more potent than our North American flavourings. I just happen to have some, so that’s what I’ll be using. If you don’t, simply use 1 tsp. almond flavouring. Another substitution I’ll be making is that I’ll be using a Speculaas Spice Mix rather than the cardamon, clove, and cinnamon called for in the recipe. If you’d like to do the same, I have a recipe for the mix here. I should add that they’re not as spicy as some I’ve had but they’re pretty darned tasty. Here’s the recipe, as written (translated); my measurements are in parentheses. Sift together the flour and baking powder. Mix all ingredients together in the bowl of your stand mixer, at low speed until mixed, then at high speed until you have a smooth dough. 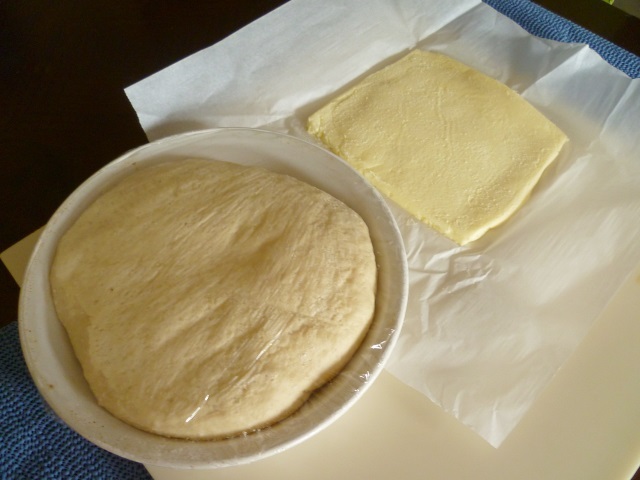 If the dough is too soft to work with, refrigerate until it’s firm enough to roll. Roll out the dough on a lightly floured surface and use cookie cutters to cut out shapes or use the dough in a speculaas mold. Bake at 170-200ºC (350ºF) for 10 minutes or until cookies are set. The dough has now been resting in my refrigerator for 24 hours, just chillin’. We, on the other hand, had a lovely day. We took my daughter and her kids to see Cirque du Soleil’s production of Varekai; it was our Mother’s Day present from John. Afterwards, we had an enjoyable dinner at the Blind Angler in Summerland, shared some wine and discussion, then slept until 9:00 this morning. A busy but fun day, all in all. Now, however, it’s time to concentrate on the croissants. This part of the process will take about an hour. Again, it isn’t difficult. It isn’t really even all that time consuming because the dough will, again, be doing a lot of chilling. 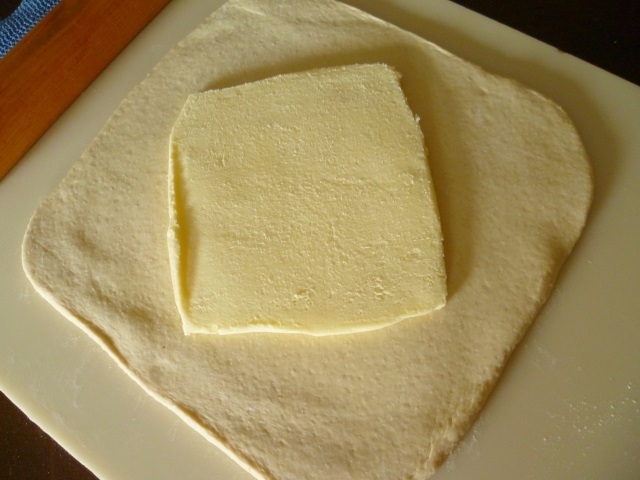 The first thing we need to do is to roll out the dough into a square, about 11″. Mine’s a little bigger than that but you don’t want to go too much larger. Then comes the butter… everything’s better with butter! Basically, what’s happening here is that the butter will be completely encased in the dough, so the seams need to be sealed well. We don’t want any of it to escape. Now, we roll. We don’t want the dough to get wider, just longer, so it will only be rolled lengthwise. Once it’s about 24″, it’s time to stop. The next step is to simply fold it up and put it to bed. Honestly, that’s what we’ll be doing. 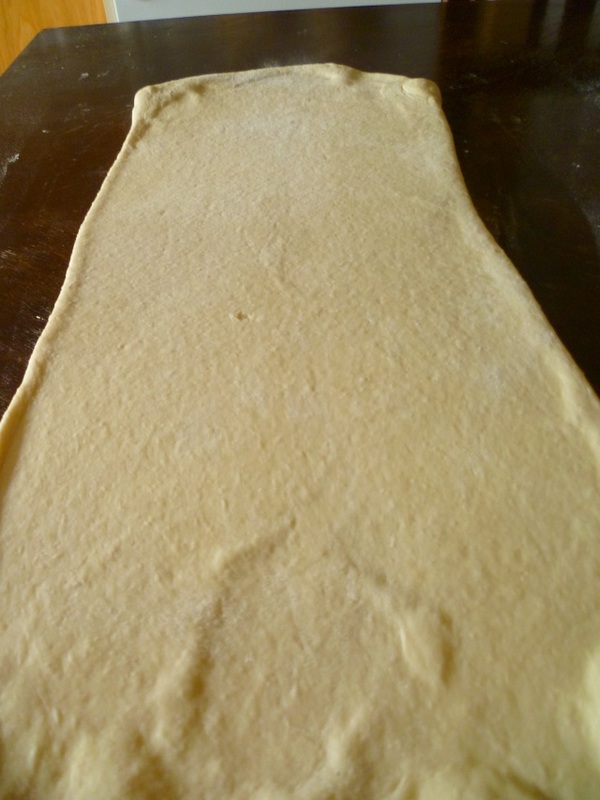 Just pick up the bottom edge of the dough, bring it up about one third of the way, then pick up the top edge and fold it down over the two layers. Take that dough, lay it on a sheet pan, cover it with plastic wrap and place it in your freezer for about 20 minutes. I managed to get a few bubbles in the dough but, with the next rolling, I’ll make sure they’re no longer there. After 20 minutes (or so) take it out and repeat the rolling process. Keep the open edges toward you (as in the second picture just above) and, again, focus on rolling the dough out to about 24″. Repeat the folding; place the dough back on the sheet pan, covered with plastic wrap, and freeze it again, for another 20 minutes. Repeat the last step once more. At this point, place the dough back on the sheet pan and cover it with plastic wrap, tucking the edges under the dough to prevent moisture loss. Leave it to rest in the refrigerator overnight. That wasn’t difficult, was it? Basically, what we’re doing is laminating the dough, creating layers of dough and butter. Each time we fold the dough over itself, we’re creating more layers of dough and butter. When we bake the croissants tomorrow, the butter that is now layered between layers of dough will melt and the releasing steam will expand to create those lovely, crispy layers we all love about croissants. Incidentally, this layering/laminating is also how puff pastry is made. The only real difference between the two is that croissants have yeast in them, while puff pastry doesn’t. Now, doesn’t that make you want to try making your own puff pastry next? We’re done for today. Tomorrow, we bake!